Every watch collector needs a bold watch. I'm not talking about a watch with the usual—and amazing—complications. Minute repeaters, moon phases, jumping second hands, chronographs, and subdials may seem bold if you usually wear a vanilla Patek Philippe Calatrava or a Rolex Submariner. When you step up from a Frederique Constant Classic Automatic to a Vacheron Constantin Patrimony Perpetual Calendar, it may feel that by adorning your wrist now with a perpetual calendar, moon phase and date subdial, you're making a bold change. The bold Egard Passages watch. But that's not what I'm talking about. While it is a big change to go from a watch that just tells time (and perhaps the date, too) to a watch that hypnotizes with complications, it's not an audacious change. 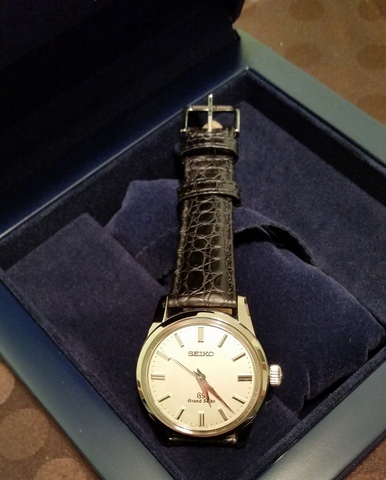 Watchmakers love compliations and watch wearers do, too. Complications are engineering marvels that make willing slaves of our eyes every time we look at our watches. Complications are like a bridge that spans distant shores, a feat that makes us wonder, "How did they make that?" at the same time as we're in awe of the bridge's beauty. But a watch with a dozen complications is still not a bold watch. A boldly different watch is one that's not even shaped like a watch or that uses a technology most watchmakers wouldn't dare to incorporates. It's a wristwatch that's a collaboration between humans now and humans from the future. An encounter between fine watchmaking and fluid mechanics. One might say a utopia. Shattering all certainties, steamrollering conformity, the idea that led to the H1 was simple and consisted of two flexible reservoirs fixed to each end of a capillary. In one was an aqueous liquid filled with fluorescein, and in the other, a transparent viscous liquid. To keep them separate: the repulsive force of the molecules in each liquid, with a meniscus to mark the boundary between the two. As the hours go by, the fluorescent liquid advances. An emotional accelerator, the meniscus, in the shape of a half moon, marks the breaking point with the other fluid in the tube, indicating the time. At 18:00, the fluorescent liquid comes back to its original position, going backwards. The secret that gets the reservoirs going? Two bellows made of a highly resistant, flexible electro-deposited alloy, each driven by a piston. Now that's a different and bold watch. So is the Ressence Type 3 , in which the watch hands and subdials continually revolve, producing the sensation of watching orbiting planets. The floating hands are in a chamber filled with oil and the movement is in an invisible chamber below. The movement tells the hands where to go with magnets. Because the hands and movement don't touch, Ressence watches are sensational symphonies of motion. 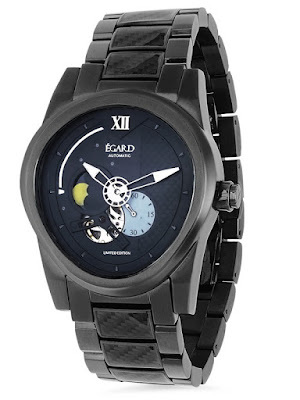 Slip on a Egard Passages watch, designed in collaboration with Star Trek's first captain, William Shatner. This day-and-night indicator watch is shaped like something from the future, in the form of an arched triangle cornered with soft curves. The cutaway seconds dial and movement window are off-center on the Egard Passages, but in the right places to make this watch a distinctly different visual treat. Who says all watches need to be round or square? 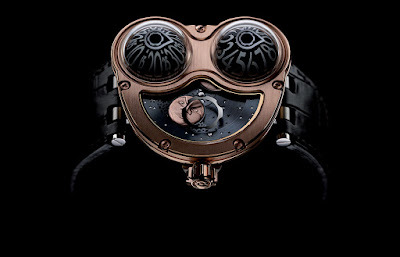 The MB&F Moonmachine. Photo by MB&F. Devon Works' Star Wars watch may not be the one you want to have on your wrist when you make a presentation at your company's next meeting. Or maybe it is. A Devon Works Star Wars watch is as different from a classic dress watch, such as a Blancpain Villeret 8 Jours, as the Delorean in Back to the Future is from a Volkswagon bus. From the way it's powered and controlled (a rechargeable lithium battery and four time belts) to its size and shape (66.3 mm x 61.2 mm with angled edges and a case that forcefully expands into the space outside of the watch itself) to its design (something that makes you feel like if you shrank yourself you would be able to fly that watch to another galaxy), this is a watch that's not for the timid. So maybe wearing this watch at your next meeting will intimidate everyone into acquiesce. An MB&F Moonmachine is unlike any other moon phase watch you have put on your wrist...or probably have thought about putting on your wrist. The eerily sentient moon stares at you while you watch the globose domes that contain the hour and minute discs. These are bold, daring, innovative, exciting watches. The question is, are you daring and exciting enough to wear one of them?